The Huzzah ESP8266 module is an inexpensive microcontroller with WiFi capabilities. It can be programmed with the Arduino IDE so that you don't need a separate microcontroller! This device gets the latest weather information from DarkSky.net and displays it on a 1.3" monochrome OLED display. Note on difficulty: this is an intermediate level project and involves running a PHP script on a web server to parse data from DarkSky.net before it gets read by the Huzzah. It's helpful to know some basics about PHP and web servers before starting this project! This project was created by Daniel Eichhorn and the code was forked to work with Adafruit hardware and libraries. The weather icons were created by Alessio Atenzi. Dano Wall designed the lasercut enclosure. A web server running a small PHP script. You can even use a Raspberry Pi running locally on the network or any web hosting service you use. The goal is to solder the Huzzah and OLED breakout boards so that the OLED screen and Huzzah module are facing in opposite directions. The two buttons on the Huzzah need to be accessible to put the module into bootloader mode and program the Huzzah. The power and ground will ultimate be connected to the 5V and GND pins on the microUSB breakout board. We'll use a microUSB cable to power the device. On the OLED breakout, solder the two solder jumper pads SJ1 and SJ2 so that you can use the I2C protocol. Do this before soldering the boards together! You should get a 6-pin right angle header to solder into the Huzzah FTDI pins. Do this before soldering other things together! Be sure to solder all six headers securely. Ultimately you will solder the two boards with a header pin lining up V+ on the Huzzah and Vin on the 1.3" OLED. This way all the boards will stack up nicely. Make the other wire connections before soldering the two together however, since it will make the process easier. I've found that thin-gauge, wrapping style wire works best. Start by soldering a header pin into the Vin on the 1.3" OLED breakout. If we examine the schematic again, notice that the Huzzah has two GND pins. Since there will be multiple connections to the same GND pin, it can be helpful to solder a male header pin into one of the GND pins. Make sure it's sticking out more on top, so solder it on the bottom of the Huzzah board. Now make the other connections between the Huzzah and OLED breakout board following the schematic below using thin wire. Remember, ultimately you'll use the header pin soldered into the OLED breakout to make the 5V power connection between the two boards. Now you can solder the Huzzah and OLED breakout boards together. They should be facing away from each other and lined up like this. Place the Vin header pin on the OLED breakout into the V+ on the Huzzah. Now connect the MicroUSB breakout. Connect the 5V pin to the header pin going through V+ on the Huzzah. You can also connect the GND pin on the MicroUSB breakout to the header pin sticking out of the Huzzah GND. Once you've attached the MicroUSB breakout you can cut down the excess header on the V+ pin and GND pin. The circuit is assembled! Download the code from github by clicking Download ZIP. Uncompress the file and find the folder named php. Using an FTP client, upload these files to a web server which runs PHP-- most of them do. You can even run it on a Raspberry Pi on your local network. Be sure to also include the contents of the lib folder. This PHP script parses some information from DarkSky.net and takes some of the heavy string processing off the shoulders of the ESP8266. Go to https://darksky.net/dev/ and sign up for a free API key. At the free level there's a pretty generous limit to the number of requests per day you can make, well below what we'll be using. Alter this URL to point to your PHP script, replacing YOUR_DOMAIN_NAME with the actual domain name hosting your script and replacing APIKEY with the API key you received from forecast.io. This longitude and latitude are for New York City- feel free to change them to get the weather for your location in the world. NASA has a good tool for finding your longitude and latitude. Make sure to use Arduino IDE 1.6.4 or higher and follow this tutorial to install the ESP8266 board packages. Download the code from github by clicking Download ZIP. 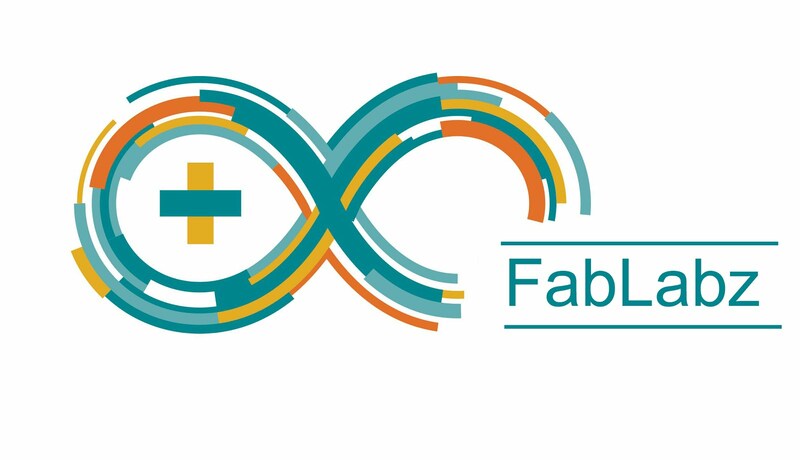 Uncompress the file and copy the folder to your Arduino sketchbook folder. Attach the Huzzah ESP8266 to your computer using an FTDI cable. Since it's possible to connect the FTDI cable backwards, make sure to line up the black wire on the FTDI cable to the GND pin on the 6-pin connector. The Huzzah will get power from the FTDI cable, you don't have to have the microUSB plugged in. Make sure the code compiles properly. All of the relevant libraries should be included. For more information on using the Huzzah ESP8266 module with the Arduino IDE, follow this tutorial. You'll need to make some modifications to the code to make it work properly on your WiFi network. Replace YOUR_WIFI_SSID with the name of your WiFi network and PASSWORD with your WiFi password. Keep the quotation marks! Replace YOUR_FORECAST_API_KEY with the API key you received when you signed up with DarkSky.net. Keep the quotation marks! Replace YOUR_DOMAIN_NAME with the domain name hosting the PHP script, e.g. adafruit.com. Keep the quotation marks! In WeatherClient.cpp feel free to alter the URL path to reflect the location of your PHP script on the web. It's a good idea to test the PHP script at this point by pointing your web browser to: http://YOUR_DOMAIN_NAME/weather.php?apiKey=APIKEY&lat=LATITUDE&lon=LONGITUDE&units=UNITS making the appropriate substitutions for APIKEY, LATITUDE, LONGITUDE and UNITS. This longitude and latitude are for New York City- feel free to change them to get the weather for your location in the world. NASA has a good tool for finding your longitude and latitude. Attach the Huzzah to your computer using an FTDI cable, making sure to plug it in the right way. When you're ready to upload the code, put the Huzzah module into bootloader mode. You'll have to do this before each upload. There is no timeout for bootload mode, so you don't have to rush! It can be difficult to access the buttons once the module is in the enclosure! The best way I've found is to manipulate the two buttons with two pairs of tweezers. Use the Arduino IDE Serial Monitor at 115200 baud to check for error messages. The device should connects to WiFi and download the webpage immediately, and then do this again every ten minutes. Make sure the URL matches the actual location of your PHP script. You can test it by pasting it into a web browser. If the code is uploaded correctly, you should see the display showing the weather for "Now", "Today" and "Tomorrow". Start by removing the protective sticker from the OLED breakout. Place it into the laser-cut acrylic piece with the corresponding hole or window. Notice the small notch which corresponds to the OLED ribbon connector. It can help at this point to remove the double-stick tape affixing the OLED to the breakout PCB in order to get things lined up well. Start by putting a 1" screw through the top left hole (if the screen is facing you). This screw will go through all three breakout boards, lining them all up! Start by putting two hex nuts between the the OLED breakout and the Huzzah breakout and putting the screw all the way through. Don't overtighten though! Add a 3/16" nylon spacer and hex nut at the end. Place the 3/4" screw into the top right hole of the Huzzah breakout. You might need to angle this in to get past the OLED breakout. Tighten down with a hex nut. Place the 1/4" screw through the top right hole of the acrylic and secure it on the other side of the OLED breakout with a hex nut. This can be a bit tricky- you may have to hold the hex nut in place with needle-nose pliers while you tighten the screw with a screwdriver. Add a nylon space and hex nut to the 3/4" screw. Attach the microUSB breakout to the other piece of lasercut acrylic. Use a 1/4" screw and hex nut to fix the left hole of the breakout to the acrylic on the side with the cutout notch. The cutout notch is there to allow a microUSB cable to connect. Place the other hole of the microUSB breakout through the 1" screw and secure with a hexnut. You can also secure the other side of the acrylic with a hex nut. Now for the easy part! You just need to add the bottom two screw. The spacing can be set using three hex nuts here. Add another 1" screw on the other side and do the same with 3 more hex nuts. You're done with the enclosure! Attach a microUSB cable to a computer or 5V power adapter and power it up! 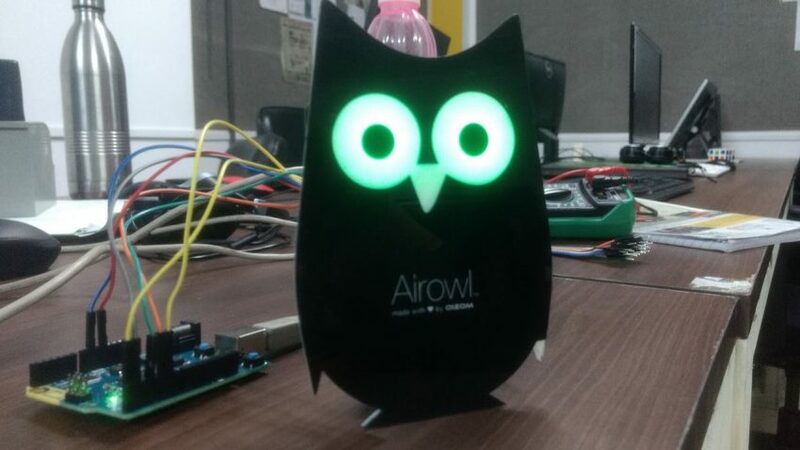 This owl is not only an adorable DIY project, but a practical air quality monitor. Posted by Team Oizom (Anith Patel and Sohil Patel) on Hackster.io, AirOwl uses an Arduino 101, a dust sensor and Adafruit Neopixels to reveal air quality. Data is displayed in three ways—through a mobile Blynk app, the color of the owl’s eyes and within Arduino’s serial monitor. Of course the eyes are most fun, enabling you to get an instant read from a distance. Green=safe environment, Blue=take care and Red= danger. The app is easy to put in place and uses BLE to bring data into gauges for the different particulate matter types. The team has placed instructions for setting up the app on their project page, as well as links to Github for the owl design files, PCB files and code. This project won 3rd place (student) in Hackster’s Earth Day: Planet Pulse contest. For any teacher incorporating STEM education, this would be a great project to build and monitor throughout the year, especially if your classroom has windows that open. Even if you don’t have the capability to produce the pro owl design, you could still work with cardboard and opaque paper to create a similar look, paired with the breadboard version of electronics. Sending big high fives to Team Oizom for creating a project that is well suited for classrooms and citizen scientists. Analyses home air quality and records the values in a SD card. around 20 male to male 15cm jumpers. The quality of the air that we breathe, is very important to our health. This device analyses the air quality inside our homes, and records the values in a SD card. By analyzing the stored values, we know how the evolution of the parameters thru time was. I will use temperature, humidity and air quality sensors that are cheap enough to use in this kind of project, without sacrificing too much the precision. The main idea behind this project is to know if the air is breathable or not. CCS811 Air Quality Sensor module, approx $19.95. I started by downloading the latest version of the Arduino IDE from https://www.arduino.cc/en/Main/Software choosing the windows installer. After the installation is complete, be sure to read carefully the Adafruit Feather M0 Adalogger user manual. pinMode(13, OUTPUT);// initialize digital pin 13 as an output. After sending this code to the FEATHER M0 ADALOGGER, I had no errors and the red LED on the board (connected to port 13 ) started flashing. Everything was OK. 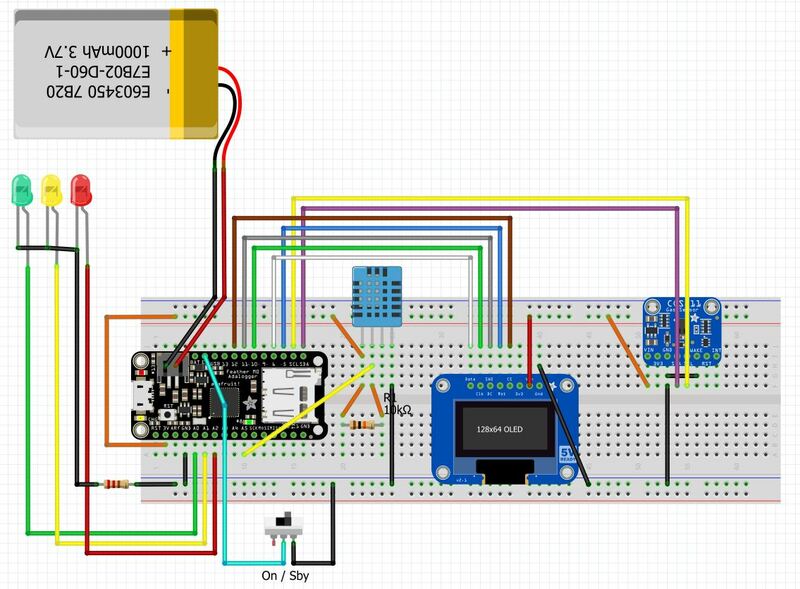 Using the OLED Display documentation, Install Adafruit SSD1306 and Adafruit GFX Libraries. Restart the Arduino IDE. I had a compilation error complaining about an incorrect display height. This is because the library file SSD1306.h was generic and I had to edit it, to select the correct height of my display (64). Find the relevant lines and select the correct value by commenting the incorrect lines. NOTE: Don't use pin digital 9 if you plan to use the battery voltage monitoring in A7. Digital 9 and A7 share the same pin. I found that in the hard way, after hours of bad Vbat readings and bad display behavior. Connect DHT 11 according to the diagram. (Don't use the pin D13 on the board to read DHT11 data. Pin D13 has a LED connected permanently, it presents a low impedance and is not suitable for this kind of use). I used Adafruit_CCS811 library version=1.0.0 and everything works fine. To be able to record the values thru time, I used an old 512MB uSD card. This Adalogger board is fantastic because it already has a uSD Card slot. I use here the Arduino library version 1.2.2. and the pin D4 as the CS pin for SD. In the next figure i show the format os the data in SD Card. It is comma separated, in order to be opened by spreadsheet software for analysis. In this example, data is being recorded every 5 minutes (300 seconds). Replace 300 by the number of seconds you want between SD writes. That simple. The file is in csv format (comma separated values) meaning that all values are separated by commas. It can be easily imported by a spreadsheet to further analysis. A time stamp is essencial for the data-logger. For now, I'm using and evaluating the internal RTC with RTCZero library. The next thing to do is to find a way to adjust the time. Stay tuned! Well, i'm still in the evaluation phase, and hoping someone wants to build a similar circuit to help me improve this useful data logger. 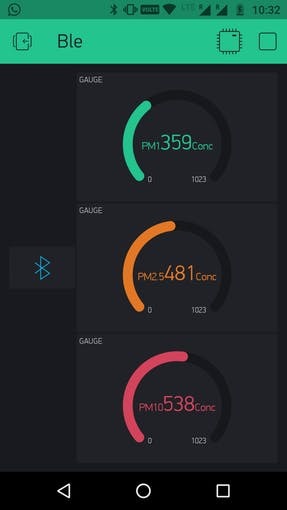 This is the second version of the Air Quality Analyzer Connections. Now we have 3 LEDs to display 3 levels of alarm, and a Sby/On switch. Also DHT11 sensor is connected to a new pin (A5) to avoid some instability caused by pin 13 internal LED circuit. unsigned long nseconds; //seconds since start of day. pinMode(SD_led, OUTPUT);// initialize digital pin 8 as an output. pinMode(green_led, OUTPUT);// initialize digital pin as an output. pinMode(yellow_led, OUTPUT);// initialize digital pin as an output. pinMode(red_led, OUTPUT);// initialize digital pin as an output. display.begin(SSD1306_SWITCHCAPVCC);// by default, we'll generate the high voltage from the 3.3v line internally! Serial.println("Failed to read from DHT sensor! ");// Check if any reads failed and exit early (to try again).